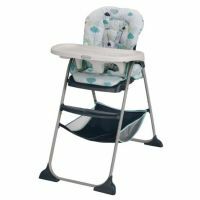 1901847 Gracos Slim Snacker is the ultra-fast folding highchair, with a one-hand, one-second fold. Moms and dad will love how easy it is. Once folded, its ultra-compact, so it fits in small spaces and is self-standing for easy storage. Cleaning this slim highchair is a snap too – just wipe the seat pad down to keep your child's dining space tidy. A large mesh storage basket for your child's favorite things and a full-sized cupholder keep it convenient, while the three-position reclining seat, footrest and seat pad keep your child comfy during meals and snacks. 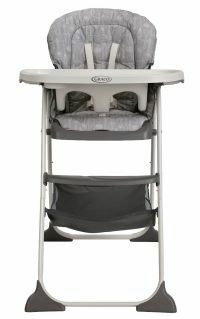 To Recieve updates and possible rewards for Graco Graco Slim Snacker High Chair - Harvest please sign in. To Recieve updates and possible rewards for High Chairs please sign in.